As a digital publication, we can be far more agile and responsive, producing content daily, weekly and monthly to help golf travelers plan their next day trip, weekend getaway or weeklong buddy vacation. 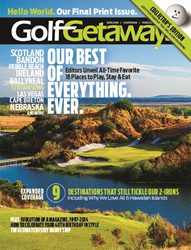 The award-winning golf-journalism team behind GolfGetaways Magazine (formerly Fairways + Greens) announced today that it has acquired the publication and all branding assets from Madavor Media, LLC, and will launch a new blog-based website (http://www.playgolfgetaways.com) and monthly digital editions on the Apple, Amazon and GooglePlay platforms beginning Sept. 8, 2014. The magazine’s final print issue, published by Madavor Media, will hit newsstands in late August and subscriber mailboxes in early September. In addition to coverage of such iconic golf destinations as Oregon’s Bandon Dunes, Streamsong Resort in Florida and desert stalwarts Las Vegas and Scottsdale, the issue also includes Editors’ Picks of their all-time personal favorite 18 places to play, stay and eat. GolfGetaways will now operate under the umbrella of golf-packaging company Intermountain Golf Travel, LLC, co-owned by longtime landscape photographer Brian Oar, who recently won top honors for golf photography at the 2013 International Network of Golf Media Awards. Both Bunch and Oar, along with the other original members of GolfGetaways’ Essential Destinations team — Fairways + Greens founder and executive editor Vic Williams and TV/radio personality Mitch Laurance — are committed to surpassing the print magazine’s award-winning success and expanding the brand’s reach to new golf travelers throughout North America and around the world. —Shane Bacon, who covers the PGA Tour and more for the Yahoo! Devil Ball Golf blog, will post his golf-travel-related stories on the new GolfGetaways website, kicking off his coverage in September with a preview of the much-heralded Cabot Cliffs project on Cape Breton Island in Nova Scotia, Canada. —Midwest contributor Eric N Hart, who last year played the entire Robert Trent Jones Golf Trail for an issue of the magazine, logs on as GolfGetaways’ new Rankings Editor, spearheading the effort to create a new interactive rankings system that will debut in 2015. —Longtime contributors Blaine Newnham (former Seattle Times associate editor and Eugene Register-Guard sports editor, plus author of the upcoming “America’s St. Andrews” book about U.S. Open host Chambers Bay) and writer-photographer Robert Kaufman (former director of the Visit California “Official California Golf Guide,” among other publications) will also bring their travel insights and opinion to the new website. —Emily Gomez, director of operations for @JoshJohnson (#JJ) on Instagram, the largest mobile photography community in the world, and her partner Ethan Goldhammer will also travel for GolfGetaways to capture new photography and video from a young couple’s and novice golfer’s perspective. Gomez has been shooting professionally for seven years and Goldhammer has been a videographer for more than 10 years. For editorial or advertising inquiries, or more general information about the all-new GolfGetaways, please contact Darin Bunch at (661) 979-0979 or darinbunch@mac.com. GolfGetaways is also available via social media at GolfGetaways on Facebook, @GolfGetaways on Instagram, @GetawaysGolf and @GolfGetawaysMag on Twitter.